Patinir’s biography is difficult to reconstruct due to the scant amount of information that has survived, particularly relating to his early years. His place and date of birth continue to be debated, and it has been suggested that he was born in either Dinant or Bouvignes, both in southern Belgium. The first documentary reference to the artist dates from 1515 when he entered the guild of Saint Luke in Antwerp. He married twice, first to Francisca Buyts, daughter of the painter Edward Buyts de Dendermonde, then to Johanna Noyts. The date of Patinir’s death is known to be before 5 October 1524 from a document of that date that refers to his second wife as a widow. Patinir was one of the first artists to specialise in landscape as an independent subject. 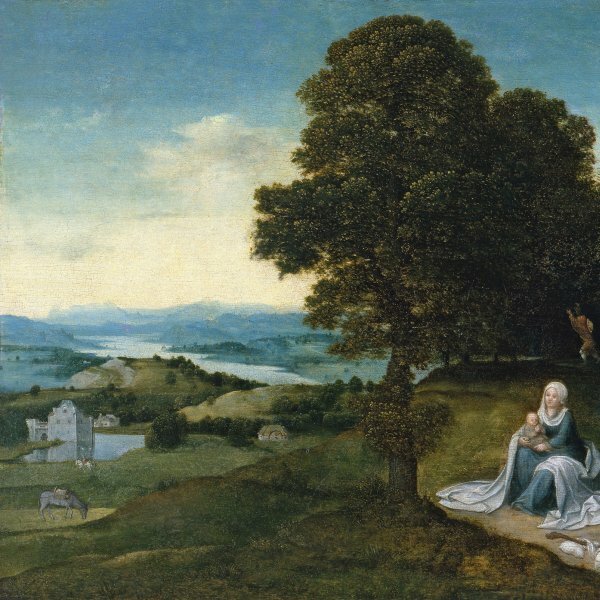 While his compositions always include igures that refer to a narrative (generally religious) content, they were sometimes added by other painters and are never more important than the landscape setting. The backgrounds in these works are depicted from an elevated viewpoint, with the horizon line located in the upper part of the composition, creating a panoramic view. Patinir’s style is characterised by a minutely detailed technique in which every element is meticulously represented and by a preference for dark tones. The landscapes in his works are comparable to those painted by earlier artists such as Jan van Eyck, Gerard David and Bosch but he was the first artist to give them such prominence. It is thought that before he moved to Antwerp, Patinir may have work in Bruges in Gerard David’s studio or at least within his circle of influence. The records of the painters’ guild in Antwerp do not refer to any pupils of the artist but according to Dürer, who visited Patinir during his trip around the Low Countries, the artist had a flourishing studio in Antwerp with various apprentices. He frequently collaborated with other artists, including Quinten Massys and Joos van Cleve.